Group conversations. Do those two words make you feel tense? Do you feel your stomach getting a little tighter and your pulse rising a bit? If you do, you’re like a lot of introverted people! While we enjoy getting to know other people and connecting with them, big group conversations aren’t really our thing. 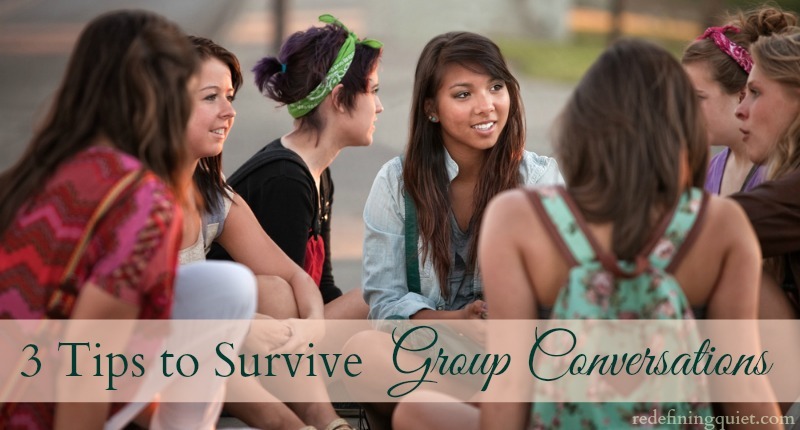 A lot depends of course on the size of the group, how well we know the people in the group, and even how much energy we have on a particular day (the more drained we are the harder group conversations will be.) In general, though, many introverts prefer spending time with a couple of close friends or maybe a small group at a dinner party or something like that. 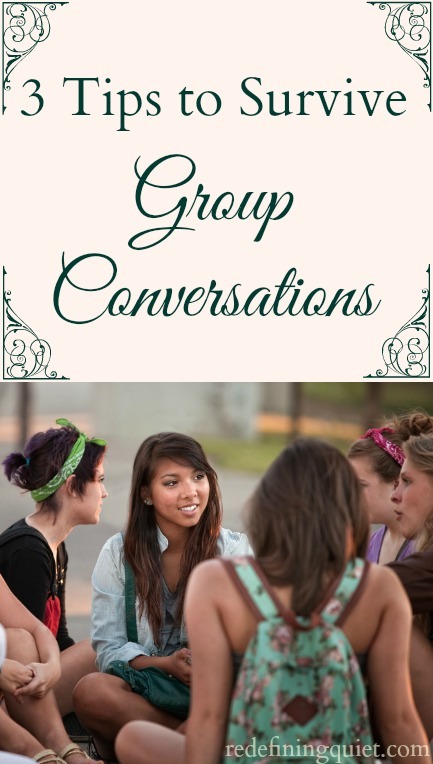 Group conversations are unavoidable, though, and we all end up being part of them at one time or another. These are just a few things that I’ve found have been helpful for making group conversations a little bit easier. It can be frustrating for us introverts when we think of the perfect thing to say, but we either can’t get a word in edgewise or we think of it too late and the conversation has already moved on to a new topic. As frustrating as it may be, though, it can be helpful for us to remember that we’re not in our element. We might not be able to contribute as much to a group conversation as we can to a more intimate conversation with a few close friends. One thing we can do, though, is to remember those things we thought of to add to the conversation, those little insights we had or the story we remembered, and we can try to file those away in the “To Be Used Later” part of our brains. That way, if we’re ever in a similar conversation with a smaller group of people, we can remember those things when we have the chance to actually use them in the conversation. Everyone loves to feel like someone is listening to them. And not just halfway listening while they think of the next funny story they want tell, but really listening. Being fully present and listening with the intent of trying to understand. Introverts aren’t necessarily better listeners than extroverts are (especially since we can be distracted by our thoughts and our internal processing), but we do usually have more practice listening since we tend to do it a lot more often. Since we are often in the “listening” role in group conversations, one of the best things we can do is to focus on becoming a really good listener. We might not always be able to think of very much to say during the conversation, and we might not be able to entertain everyone with a hilarious story like some people are so good at doing, but the one thing we can do is to leave people with the feeling that we have truly listened to them – that we’ve appreciated their stories, laughed at their jokes, and really tried to understand them. And another benefit of listening is that if we’ve been active listeners and if we’ve been using our natural introverted tendencies of reflection and observation, we might find that we can even think of something interesting to add to the conversation – like maybe a different perspective that others hadn’t thought of or a story that connects to that topic. 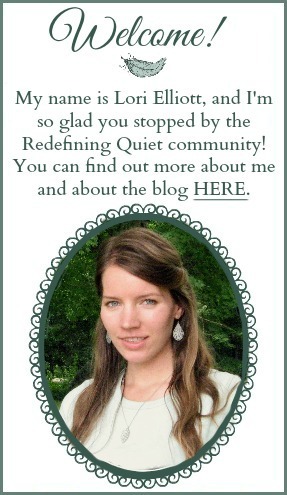 Finding out about the fact that I’m an introvert has really helped me a lot with this one. Once I realized that it was my natural tendency to be a quieter person and a listener and observer and that I’m more in my element with one-on-one conversations or in smaller groups, I was able to stop putting so much pressure on myself to always try to think of something interesting to say. That mindset of feeling like I had to say something usually backfired because then my mind would freeze and I wouldn’t be able to think of anything to say at all. What I’ve found, though, is that by relaxing that pressure and by allowing myself to just listen, I’m a lot more likely to actually be able to think of something to say. Not all the time, and I still have those mind-going-blank moments a lot, but it’s less often than it used to be. And even if I can’t think of something to say, but not feeling like I absolutely have to say something, I’m a lot more able to just relax and enjoy listening to the conversation. If you’re an introvert, what things have helped you in group conversations? 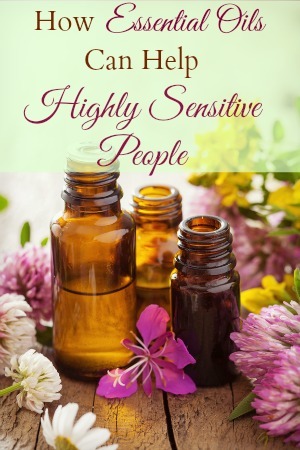 ← Are You Taking Advantage of this HSP Benefit?